September 7, 2013 (NEW YORK CITY, NY) – Samuel Cole Salon educator and stylist, Jenny Smith worked backstage at New York Fashion Week with the Sebastian editorial team on Christian Siriano’s 2014 Spring Collection show at Eyebeam Atlier. Smith created exotic, beachy pony tail styles inspired by Christian’s extended stay in Mexico. “Executing the look to perfection with the fast pace rush to complete 35 models while Christian did a calm stroll through backstage to see his vision come together was unforgettable. Working with lead stylist, Anthony Cole and the entire Sebastian team was fabulous. The passion for our craft filled the room. I look forward to my next backstage opportunity,” said Smith. 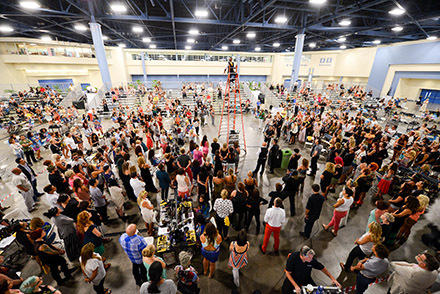 June 2013 (MIAMI, FL) – Samuel Cole Salon stylists, Sara Beard, Carolyn Nord, Cara Harrision and Alley Biehl along with salon owners, Jack & Joelle Ray helped set a Guinness Book of World Records record when they attended the Creative Hands-On Event at Oribe Backstage Miami. 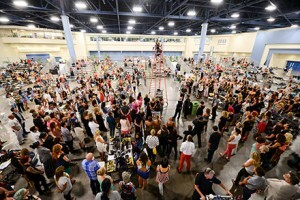 The record for “The Most People Styling Hair Simultaneously” was set with 364 stylists participating in the event. “It was crazy, exhilarating and over-the-top. I wouldn’t have missed it. So much talent in one room. What a thrill that we helped set the record while having so much fun,” said Nord. June 8-10, 2013 (RALEIGH, NC) – Samuel Cole Salon owners, Jack and Joelle Ray along with salon top stylists, Sara Beard, Carolyn Nord, Cara Harrison and Alley Biehl attended Oribe’s Backstage 2013 held in Miami. The multi-day event featured “La Fama”, an electric presentation celebrating all that is Latin. Upon their return from Miami the stylists hosted a class recreating the “La Fama” event at Samuel Cole Salon. Each Samuel Cole Salon stylist had the opportunity to interpret the inspiration and transform their models into “El Chupacabra”. “Working with Oribe is always amazing. He is so creative, open and generous. 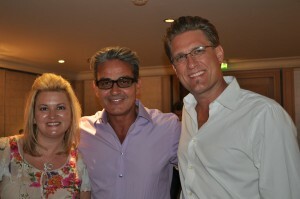 We love having him as a mentor,” said Joelle Ray, owner of Samuel Cole Salon. Jack and Joelle Ray, owners of Raleigh’s award-winning Samuel Cole Salon, turned a dream into reality when they traveled to Paris to participate in Giorgio Armani’s couture Armani Privé show on July 6. Celebrity stylist Oribe Canales, who has styled the hair of Jennifer Lopez and Lady Gaga, selected the pair to be part of his exclusive team of hair stylists for the fall collection’s show because of their expertise and vast knowledge of the hair industry. The high-energy couture show entertained guests that included celebrities, models and fashion critics from around the globe, such as actresses Megan Fox and Cate Blanchett. Behind the scenes, adrenaline was also pumping. As members of the stylist team, Jack and Joelle helped create sensational hair looks to balance Armani’s fall line. Models with thick, long blonde hair that looked natural and effortlessly beautiful strutted down the runway. The Rays predict that thick, long hair will be a must-have look for the fall season after seeing Armani’s couture line and styling the models’ hair to match. Natural or with the help of extensions, long hair is a great accessory to pair with other fall favorites, such as leggings and sleek trench coats. The award-winning Samuel Cole, located in North Raleigh, features a professional hair design team whose work has been showcased on the runways of Giorgio Armani’s Couture Fashion Show in Paris and Milan and New York Fashion Week. With more than 30 years experience collaborating with fashion and beauty industry icons, such as Oribe Canales, stylist to the stars including Penelope Cruz and Lady Gaga, and Bumble and bumble’s artistic director Howard McLaren, the salon delivers superior client services including hair extensions and Brazilian Blowouts, in a chic, contemporary atmosphere. Spotlighted in Salon Today, American Salon, Modern Salon and StyleSpeak, Samuel Cole Salon stylists are sought after for their insight on style and industry trends. The salon is also the premier destination for exclusive, high fashion product lines including Oribe and Bumble and bumble. Samuel Cole is a favorite among Raleigh clientele, being routinely selected as ‘Best in Class’ for awards including Best of Citysearch and Metro Bravo. (New York City) – Jack and Joelle Ray, owners of Samuel Cole Salon along with one of their top stylists, Sara Beard visited New York City to work the runways at New York Fashion Week. The three styled hair for the designers of Skaist-Taylor, a new line by Pamela Skaist-Levy and Gela Nash-Taylor, co-founders of Juicy Couture. The new line was unveiled “city style” on a runway set up in a NYC parking garage. Skaist-Taylor boasts day-to-night dresses in flattering cuts, shrug-on knitwear, cotton-cashmere blend sweatshirts, and a variety of vaguely boho accessories. “Loved this show. The clothes were amazing. The designers were super friendly and fun and I got to meet John Taylor from Duran Duran (he’s married to Gela Nash-Taylor), said Joelle Ray.